The Weber Pulse Electric BBQ is here - this is the ultimate BBQ for urban living. 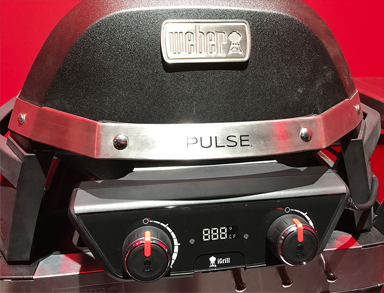 Weber have introduced Smart Grilling for 2018 with the arrival of the Weber Pulse Electric BBQ - a whole new way of barbecuing. The Weber Pulse BBQ is perfect for people who want to grill but for various reasons have been restricted to BBQ in an urban environment. Urban grilling is here - a modern BBQ to fit in with modern living - quick to get going and easy to use, this stylish new Weber BBQ is portable and can be used in a small garden or balcony. Combing high-end technology and state of the art digital performance to provide you with a revolutionary new way of BBQing. 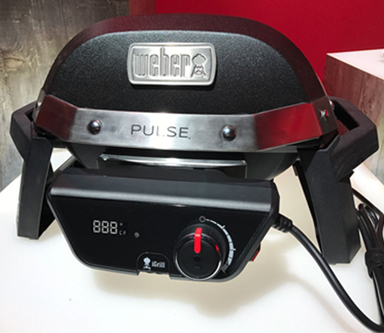 The Weber Pulse 1000 produces 1800 watts of power and is the little brother of the Weber Pulse 2000. The Weber Pulse 1000 BBQ has one heating element which is perfect for any food that is cooked directly over heat e.g. Steaks, Burgers, chops and bacon. To be able to BBQ larger cuts of meat, such as a beef joint or a small whole chicken, you will need the larger Weber Pulse 2000 BBQ. The bluetooth device synced to your iGrill App on mobile device takes away the guess work. Set your Weber Pulse Electric BBQ to low, medium or high; close the lid and wait until the Pulse BBQ has preheated - a tone will sound to indicate when it is ready to start grilling. The Grease Management System for the Weber Pulse BBQ is the same system used for all of the Weber Q range. It helps prevent flare ups and drippings not vaporised are funnelled into a drip pan under the cook box which can then be disposed of. Cook area Dimensions: Front to back - 13"
Left to right - 16"
Lid height - 7" Front to back - 15.5"
Left to right - 20"